artbarn52 and Framing Solutions is perfect for a small to mid-sized private gathering. With ample parking and easy access, our art gallery has plenty of space to have an after hours or weekend event for fundraisers, business gathering, singles nights, – or anything you might image. Our goal for your event is easy and fun in a great creative environment to create lasting memories for your guests. Call us to schedule a viewing and to start planning your event. artbarn52 is a perfect, fresh, new venue location fora ll types of gatherings. From small to medium sized business and personal events, artbarn52 offers an intimate gathering space with ample parking. Contact Susat at 952-222-0931. Open to anyone from any business looking to meet new contacts. Perfect for BNI, Chamber, Rotary, or other business professionals looking to expand their sphere on contacts. Everyoneis welcome. Meet and develop new business contacts within BNI. Thinking about joining a BNI? This is the perfect event to meet and learn more about the BNI benefits. Everyone is welcome. 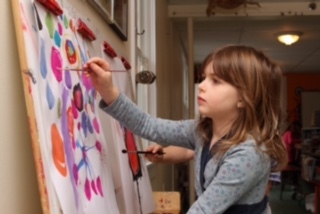 Friday April 7th “Artists Night” 5:00 – 9:00 PM: Come and meet our artists in our unique gallery. More details to follow. Meet the artists currently displaying their fine art original works at Framing Solutions art gallery – artbarn52. Our unique setting will give you the opportunity to get to know more about the artists and see more of their work with our interactive website searches. From 12:30 to 2:30 a guitarist will be playing a broad selection of music to enjoy. If you need directions or for more information, call 952-222-0931. To stay informed of future events, sign up for our newsletters. Need a holiday event site? artbarn52 and Framing Solutions is perfect for a mid-sized private gathering. with ample parking, and easy access our art gallery has plenty of space to have an after hours of weekend event. Call us at 92-222-0931 for more information. Grand opening of artbarn52 on October 7th & 8th! Join us on October 7th & 8th for the grand opening of artbarn52, the place for artists and art lovers to connect! 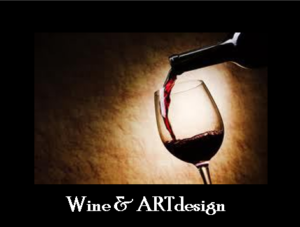 Share some wine with your friends while we design some art pieces provided by the group. Bring in your art – any size, any style, and we’ll look through options. This personal, private design time is tailored for 2-4 people per event. or just something different for a night out! We are finalizing the details and dates – so sign up for the newsletter, check back and watch for announcements on our Facebook page! 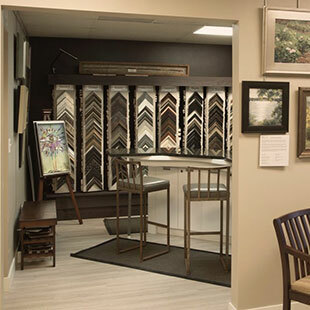 Having taught custom picture framing classes for over 5 years, I want to continue to offer (individually or to limited small groups) the opportunity to learn the fundamentals of Custom Picture Framing. 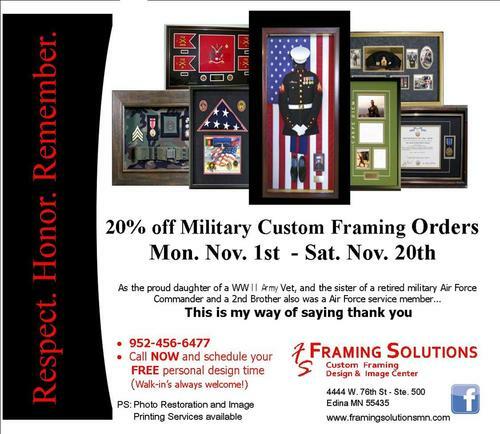 Courses are being developed for 4 different components in the custom framing process. If you have an interest in learning the creative field of custom picture framing, or how to more effectively design and enhance your own artwork – these workshops will be perfect for you! Sign up for the newsletter to receive workshop information later this year. 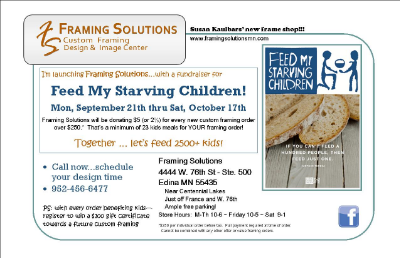 9/2015: Can a frame really change a life? Working with such a tremendous local organization, Feed My Starving Children, I hope together – we can start a ripple effect to benefit kids around the world. Let’s change some lives – one frame at a time.